It was a good run while it lasted, but it appears that India and Pakistan are back to square one. Following a meeting between Indian Prime Minister Narendra Modi and his Pakistani counterpart Nawaz Sharif in Ufa, Russia, on the sidelines of the Shanghai Cooperation Organization Summit, the top national security officials from each country were scheduled to meet for the first time in two years on Monday. That meeting has now been called off by the Pakistani side amid Islamabad’s dissatisfaction with the “preconditions” set by New Delhi for the talks. The meeting of the national security adviers–Ajit Doval for India and Sartaj Aziz for Pakistan–would have taken place as fighting along the disputed Kashmir border reaches highs not seen since the the 2003 ceasefire. The reasons the talks fell apart are primarily related to Pakistan’s reluctance to accept what it perceived as unreasonable “preconditions” by India for the NSA talks. Specifically, New Delhi wanted to restrict the scope of the talks to the issue of terrorism in particular. 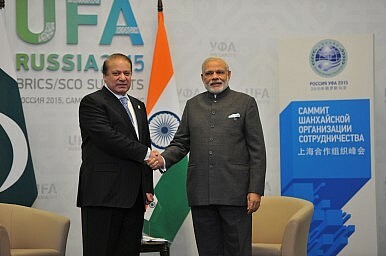 The Indian side wanted to see the meeting take place under the conditions agreed to between Modi and Sharif at their meeting in Ufa, where they agreed to five steps including “a meeting of their national security advisers to be held in New Delhi to discuss terrorism.” Beyond the preconditions issue, talks were also canceled after New Delhi refused to tolerate any scope for Pakistani leaders meeting with Hurriyat Kashmiri separatist leaders in India. Last year, foreign secretary-level talks were canceled after a top Pakistani diplomat met with Hurriyat leaders ahead of scheduled talks. The cancellation of these NSA talks reveal the problems currently permeating India-Pakistan relations. Firstly, New Delhi, unlike in the past, is showing zero tolerance toward any acknowledgment of the idea that Pakistani separatist leaders have any equities in bilateral India-Pakistan talks. Any mention of Hurriyat from the Pakistani side will be a poison pill for talks going forward. Meanwhile, Aziz’s remarks that talks under New Delhi’s preconditions would “serve no purpose” highlight perhaps that Sharif and Modi spoke too soon in Ufa when they agreed to their five-step plan. The situation is further complicated by perceptions in New Delhi that the Pakistani army and is unwilling to let the civilian government maneuver freely with India. It’s unclear where both sides will go from here. Pakistan’s Express Tribune reports that the next opportunity for the two NSAs to meet may be as soon as September, on the sidelines of the United Nations General Assembly session (where Modi and Sharif are also expected to meet again). The broader bilateral agenda agreed to in Ufa may push ahead. For example, the Director Generals of Military Operations (DGMOs) from both sides may still meet. Ultimately, the cancellation of the NSA-level talks reveals the limited scope for truly productive talks between the two sides at this point. Pakistan's history of denial complicates the prospects of peace between it and India.